Featured Image: File photo of a Durga Idol immersion in Kolkata. Kolkata, 18 September: BENGAL has put a restriction on immersion of Durga Idols in Kolkata on 23 and 24 October as the dates clash with Muharram. Going by the almanac, this year Vijay Dashami falls on 22 October when, after offering a three-day puja, the Idols of goddess Durga are traditionally immersed into river. But over the years, many community puja organisers have developed the tendency to perform the ritual even a day or two after Vijay Dashami. Bengal Chief Minister Mamata Banerjee who held a meeting with various Durga Puja committee heads and religious leaders at Netaji Indoor Stadium in Kolkata on Friday evening, made the announcement on restriction on immersion of Durga Idols in the city. 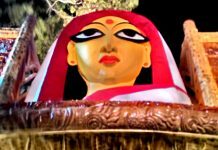 She announced that for household Durga Puja in Kolkata, the immersion of Idols will be on 22 October after the Maha Navami puja is over. There will be no immersion on 23 and 24 October as Muharram, which is observed by a large section Muslim population in the city, falls on those dates. Allowing the immersion on those two days might lead to traffic congestion and law and order situation. The immersion of Idols of all community Durga Puja in Kolkata will be from 12 noon on wards on 25 October. The immersion will continue the next day, that is, on 26 October, from 8 am to 2 pm as the Laxmi Puja falls on that day. 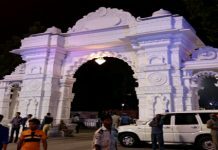 The Chief Minister also announced that the state government would extend a donation of Rs 10,000 each to the community Durga Puja organised by women in the city. The donation will be handed over through the Kolkata Municipal Corporation. I left India long time ago, but from my heart and soul I am a strong Bengali. It hurts to see that West Bengal has turned into a land filled with chaos, and I know, I cannot do anything about it. Politicians don’t care about people or their sentiments, they only care how they can steal more money from innocent people and hurt them. I wonder IS THIS THE WEST BENGAL WHERE INDIA’S FIRST FREEDOM FIGHTERS WERE BORN?. I talk to my friends in India about it, everybody says they are fed up with Mamata Banerjee, but nobody has the courage to speak up against her because they know they will be killed by Trinamool party. Government is made BY THE PEOPLE AND FOR THE PEOPLE and I guess illiterate politicians in India have not learnt this in school. I am surprised to see that this woman has not even left Durga Puja and she is playing politics in this. Even when Hindus and Muslims try to inculcate brotherhood such idiotic decisions water the feeling of hatred. What is the source of such information on restriction of immersion? Is there any govt notification or order on this issue? If so can you provide us the link of such notification / order or can you provide a copy of that? Please treat this as very urgent. Mamata cannot take this decision, because protima bishorjon is a religious rule and it has a specific time. Nobody can stop it. It is the violation of religious rights. One cannot change the date of religious occasion by executive order. It’s effect on Hindu and Muslim is bad. This is a very sensible decision. The present CM like the Left Front govt of yesteryears, will bend backwards to appease the minority,even it means change/delay the auspicious day of Bisarjan. BTW, Moharram is on 24 October all over India. Bengal must be having its own minority calendar. These same so called liberals should not shout from the roof-tops, next time a BJP led govt. postpones/delays a minority festival/ritual to adjust a Hindu festival.